Normally, a runner takes a week off to rest their body to prepare for a marathon because of how rough running a marathon is on the body. It’s generally frowned upon to run hard right before a marathon for that reason, but I wanted to do it to prove to myself I could. I planned to take the half marathon easier and go slower than I normally do then try to my best at the marathon, but I didn’t entirely account for the heat. 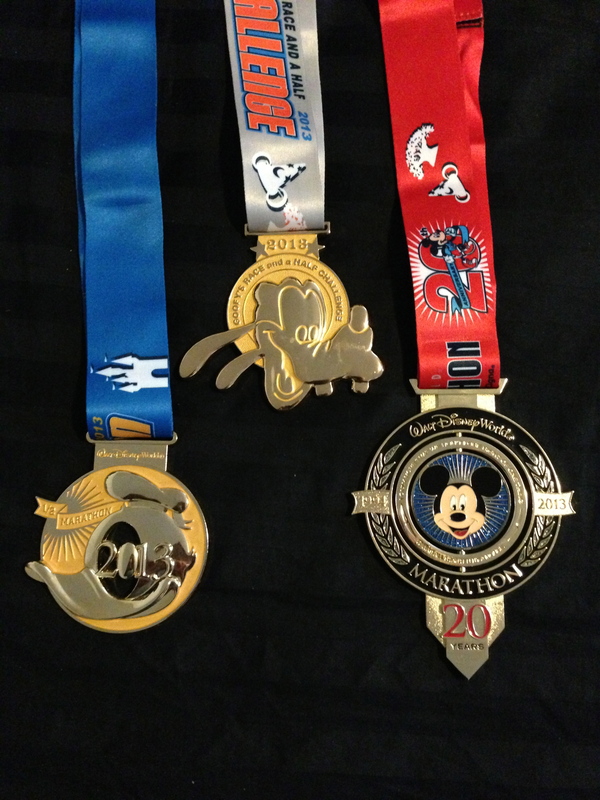 The Walt Disney World Half Marathon began at 5:30am Saturday morning, with my corral starting at 5:49am. The course for the half marathon was the same as it has been in previous years. We started running outside EPCOT and headed north towards the Magic Kingdom in the narrow roads that forced us all to run a bit too close together and the air to steam up. Running about five miles until we reached the backstage area and turned onto Main Street and ran towards Cinderella’s Castle before turning off towards Tomorrowland. 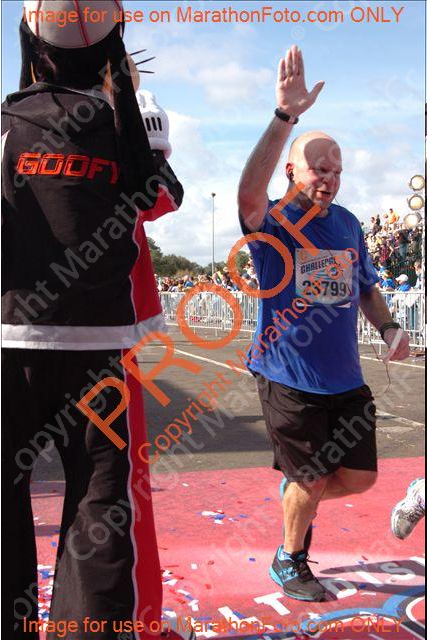 We ran through Tomorrowland, into Fantasyland and turned to run through Cinderella’s Castle. 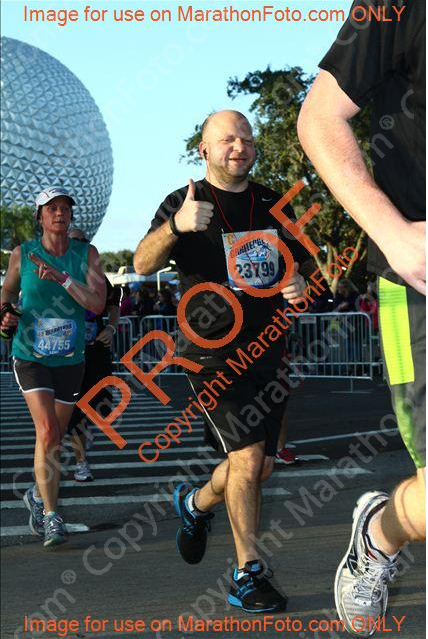 After the traffic jam at the front of the castle, it was a run into Liberty Square and the backstage area on the other side to run back down to EPCOT, with a run around Spaceship Earth and back out to the finish line. Even at an intentionally slower pace and the heat that was heading to 80 degrees as I finished, I was able to run it in 2:23:44. 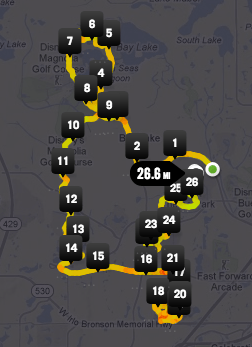 The next morning, it was back out to run again for the Walt Disney World Marathon for the new 20th anniversary route. Starting outside EPCOT at 5:49am again, it started with a repeat of the half marathon course. 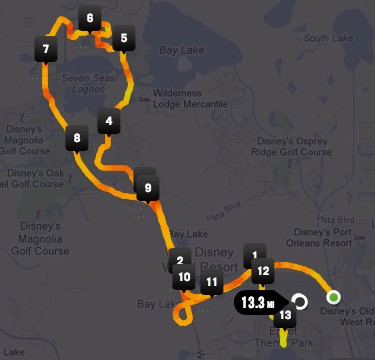 A five mile run again to the Magic Kingdom, around the same parts and out the backstage behind Liberty Square. Once we reached mile 8, the first new change to the route came about as we ran onto the race track of the Exotic Driving Experience. It was while I was on the race track, ringed by classic and sports cars, that the sun began to come up and it got hotter. It was another three miles to the Animal Kingdom and I was starting to feel the heat. Running through the Animal Kingdom before heading out towards the ESPN Wide World of Sports Complex. I was feeling worn down as we weaved through the ESPN Wide World of Sports Complex, including a lap around the track down there. It was about three miles through the complex and as we headed out and rounded a corner, we could see the big celebration that was planned for the 20th anniversary. Giant puppets with people strapped in were dancing and moving with the music, but it was enough to give me the second wind I needed. I was able to pick up my pace for the final six miles that led to and through Disney’s Hollywood Studios and another two miles to EPCOT. A run through the different countries and around to the futurist part, past Spaceship Earth and out to the finish line. Even with the heat and wear from the half marathon, I was still able to complete it in 5:02:22 – about 20 seconds slower than my NYC marathon time but almost 5 minutes faster than my performance at the Walt Disney World Marathon the year before.